I use as few “products” as possible, simply because I want to avoid putting chemicals in and on my body. But toothpaste is one of those things you just gotta use if you want to have any kind of social life. The problem with toothpaste today is that it’s filled with all kinds of gunk. Foaming agents, flavorings, dyes and toxic chemicals, such as fluoride, contaminate the pastes and gels that we put in our mouths to get them clean – seems rather counterintuitive, doesn’t it? For this post I wanted to focus solely on fluoride, since many non-fluoride toothpastes are entering the mainstream market, and it’s time we are all educated on what this chemical actually is. Fluoride is a by-product of the aluminum manufacturing process, and is produced in rather large quantities. The attempt to market it as a health-improving product began in the mid-20th century, and it was promoted to the American Dental Association because it is said to “prevent tooth decay”. More recently, other studies attempting to document the effectiveness of fluoride have been conducted. Dr. John Yiamouyiannis examined the raw data from a large study that was conducted by the National Institute for Dental Research (NIDR). He concluded that fluoride did not appear to have any decay preventing success, as there was little difference in the DMFT values (the mean number of decayed, missing or filled teeth) for approximately 40,000 children. It did not matter whether they grew up in fluoridated, non-fluoridated or partially fluoridated communities. (Yiamouyiannis, J.A. “Water Fluoridation and Tooth Decay: Results from the 1986-87 National Survey of U.S. Schoolchildren”, Fluoride, 23, 55-67, 1990). Aside from toothpaste and mouthwash, fluoride can also be found in much of the water supply in North America. In excess fluoride can produce a condition called fluorosis. This condition is characterized by the failure of tooth enamel to crystallize properly in permanent teeth. The effects range from chalky, opaque blotching of teeth to severe, rust-colored stains, surface pitting and tooth brittleness. Bony changes, characterized by osteosclerosis, exostoses of the spine, and genu valgum, usually are seen only after prolonged high intake of fluoride in adults. These changes occur due to the fact that fluoride is not biodegradable and it accumulates in the body and bones resulting in a toxic or poisoning effect. It is questionable as to whether or not fluoride should be added to toothpaste at all, but it is for certain that toothpaste containing fluoride should never be swallowed. There is enough fluoride in a tube of fluoridated toothpaste to kill two children. Since 1997 the American Dental Association has reqired all toothpastes containing fluoride to print a warning label on their packaging. That is enough to scare me off. I have been using non-fluoridated toothpaste for nearly 5 years and there has been no change in my teeth whatsoever (much to the chagrin of my dentist). I have tried many natural types of toothpaste, but Jason makes the one I love the most and it’s called “Sea Fresh”. The ingredients in this product are top notch, and the taste (from spearmint leaf oil and parsley) is so fresh and so clean! The biologically active blue-green algae, sea salts and minerals help heal detoxify and strengthen gums and teeth, while the perilla seed extracts neutralize bacteria and sugar acids. 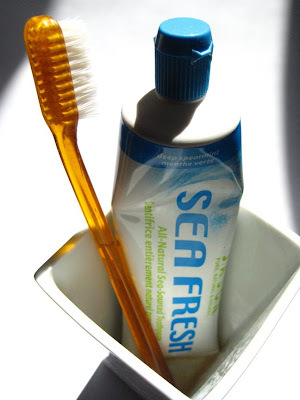 Sea Fresh even contains three natural whitening polishers: bamboo powder, calcium carbonate and silica. Many of the ingredients are certified organic and this product is never tested on animals. What more can you ask for? I came across a fascinating video, The Fluoride Deception, while I was researching for this post. It’s a little lengthy but incredibly eye opening, as it exposes the lies we’ve been fed about fluoride our whole lives. I heard about your blog a while ago, but only got the time to read it now. And I love it! You are giving so much info, together with your recipes. And your knowledge about food as medicine is great. Just ordered a few recommended books to dive in to – just what I was looking for but couldn’t find in Dutch! As I am converting from a sugar-junky myself, to a whole foods hippie kind a girl (women with my 28 years actually 😉 ), I am finding out so much. I even studied nutrition but oh-my, what they teach you there is so much defined by government etc. Well… you know what I mean. I run a Dutch food blog about the FODMAP diet, and will definitely post a few blogs again from a different approach about food: not only look at FODMAP’s while trying to handle IBS, but look at the whole picture. That said, I really want to know what kind of toothpaste and skincare products you do use. I found Dr. Bronner on your website and that already looks great, but a good toothpaste I haven’t found yet. I had a serious search for REAL natural skin care products and toothpaste but it is so hard to find! How crazy is that… just wanting to use something that is simple and natural is almost not available. Seriously took me a few afternoons and still I am not really happy with the ‘natural’ ones I have found so far. Hope to get some tips! Thank you so much for your note 🙂 I am thrilled that you’re finding some inspiration on MNR! My book is in fact in Dutch – just look where books are sold or online. Your local bookstore could also order it, I’m sure. All the best on your health journey! then add lemon or mint oil a few drops at a time (shaking at each interval…to make sure well blended and go until the taste is okay. At first you have to get used to it, it is a powder and feels grainy in your mouth, but then after awhile it starts to feel really good, and you need to rinse well.. I think just the CoQ10 kind has fluoride. First, I love your blog. It’s my new-found favorite (first the good news)! Do you have any other recommendations for oral care?